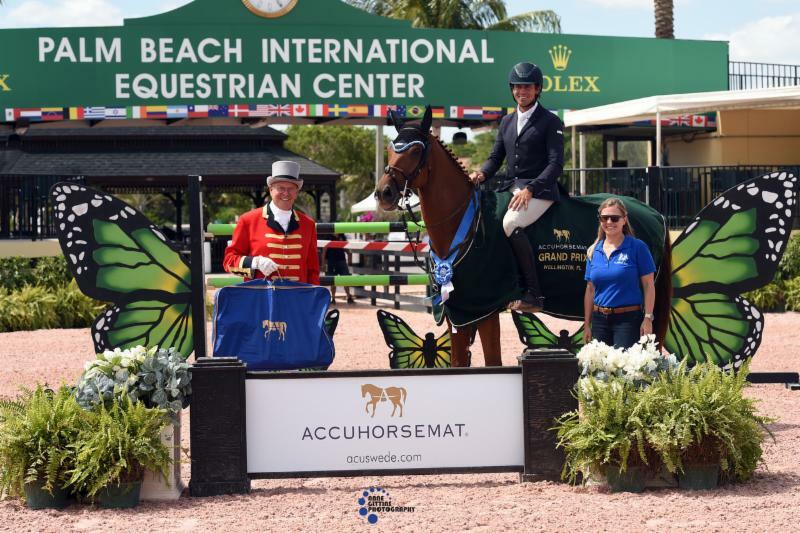 Wellington, FL – April 26, 2017 – Roberto Teran, Jr. of Wellington, FL, and Il Rubacouri earned top honors in the $25,000 Accuhorsemat Grand Prix at ESP Spring III hosted at the Palm Beach International Equestrian Center (PBIEC). The pair dashed through the jump-off timers in 34.56 seconds to take the lead ahead of Emauel Andrade and Boy IV, who took second place with a time of 34.788 seconds. Andrade also guided Bon Jovi to a top three finish, stopping the timers in 35.962 seconds for third. Competition on the final day of ESP Spring III was cancelled due to inclement weather in the Wellington, FL, area. The ESP Spring Series will continue with ESP Spring IV on May 5, at Equestrian Village, located at 13500 South Shore Blvd. Teran, Jr. and Il Rubacouri, who is owned by Teran, Jr., bested a massive class of 52 entries, who tested the track designed by Richard Jeffery. Thirteen pairs moved forward to contest the short course, while six combinations earned a double clear effort on the afternoon. “Obviously my plan was to try and have clean round. The time allowed wasn’t too tight, so there wasn’t much pressure there, but it was technical enough and had some good questions. My horse jumped great and was lucky enough to go clear,” he commented, when discussing his plan heading in to the first round track. Roberto Teran, Jr. and Il Rubacouri in their presentation ceremony with ringmaster Steve Rector and Alex De Armas of Accuhorsemat. Il Rubacouri is a talented mount who was jumping in CSI 2* and CSI 3* in Europe before Teran, Jr. purchased him with Juan Carlos Garcia, another Colombian rider based in Italy. Experienced for his age, at only nine, Teran made the most of his time in the ring after observing a few rounds complete the track ahead of him. “He’s a horse that was born in Italy. I own him with Juan Carlos Garcia who is a top international rider from Colombia based in Italy. He’s a very careful, fast horse. We’re trying to move him up into the bigger grand prix classes. He was jumping CSI 2* and 3* classes in Europe before coming here,” he explained. “He’s been fantastic. He did a few big classes during the WEF circuit, including few Saturday nights. He’s a nine year-old that is going to be very promising for the future,” commented Teran, Jr. The pair will now head to Kentucky to contest the spring competition before making their way up the East Coast, and ultimately secure plans to travel to Europe at the end of the summer, as Teran, Jr. is planning on meeting up with his Colombian teammates, as they look towards the FEI World Cup Finals in Barcelona, Spain, in September. 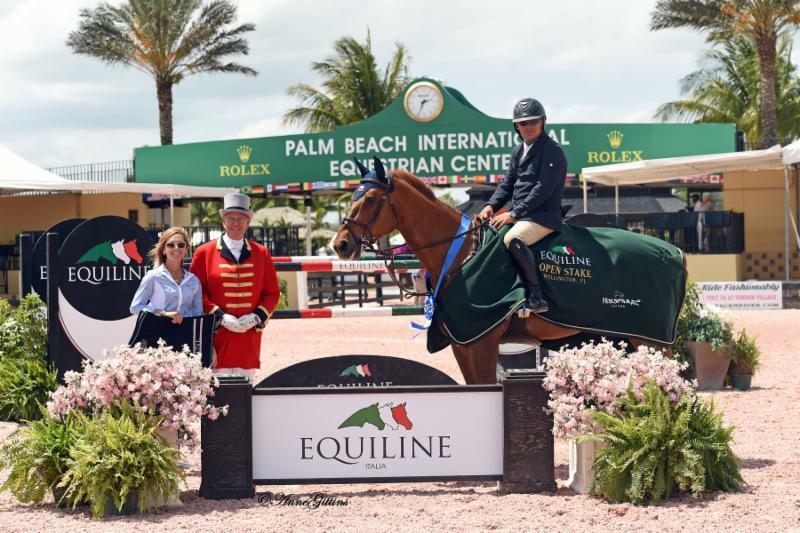 Samuel Parot of Wellington, FL, and his own Taalex rode to victory in the $10,000 Equiline Open Stake during ESP Spring III, taking the class with a jump-off time of 35.876 seconds. Emanuel Andrade of Wellington, FL, and his own Cortina 186 followed in second place, finishing just a second behind Parot, crossing through the timers in 36.434 seconds. Alex Granato of Wellington, FL, and Beorn, owned by Alliy Moyer, collected third place with a time of 36.843 seconds. Samuel Parot and Taalex in their presentation ceremony with Catie Staszak of Equiline and ringmaster Steve Rector. The class featured 42 entries, while 13 pairs advanced to contest the short course. Parot also guided VDL Aberlino to a fourth place finish, as he piloted both of his mounts to a strong top ten finish. 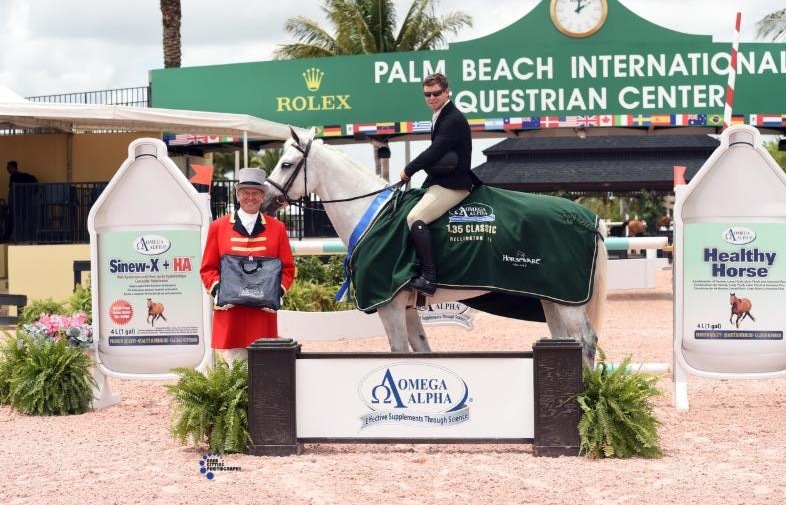 Shane Sweetnam of Wellington, FL, and Samoa, owned by Anna Beth Athey, captured top honors in the $5,000 Omega Alpha 1.35m Stake, besting a class of 43 entries. The pair stopped the jump-off timers in 29.417 seconds to take the win ahead of Jimmy Torano of Wellington, FL, and Diamant des Biez, owned by E2 Stabes, who finished with a time of 29.675 seconds. Sweetnam also guided Le Vio, owned by Gut Einhaus, LLC, to third place with a time of 29.903 seconds. Ty Simpson of Wellington, FL, and Why Not, owned by Simpson Show Jumping, Inc., rode to victory in the $1,500 NAL Child/Adult Jumper Classic, besting Michelle Carnes and Ushuaia, owned by Howard Lemus, as the only two pairs to advanced to the jump-off round. Marlee Malamut of Vallaway, NJ, and Cody, took third place after accumulating three time faults on the first round track. Lydia Ulrich of Rochester, NY, and Up Stream, owned by Beth Congel-Ulrich topped the $2,500 Gold Coast Feed Low Junior/Amateur Owner Classic with a jump-off time of 29.173 seconds. Ashley Vogel of Mequon, WI, and Twist des Forets, owned by Neil Jones Equestrian Inc., earned second place with a jump-off time of 31.156 seconds. Sophia Studd of Wellington, FL, and her own Angelica Bird, rounded out the top three with a time of 32. 635 seconds. Meghan Kaupp of Pittsford, NY, and Montenegro, owned by Lilly Ulrich, rode to victory in the $5,000 USHJA National Hunter Derby, amassing a two round score of 176. Zayna Rizvi of Greenwich, CT, and Verdana, owned by Laura Wasserman, earned second place with a score of 171, while Victoria Colvin of Loxahatchee, FL, and Easton’s Rocket, owned Pamela Landis, took third place with a score of 170. 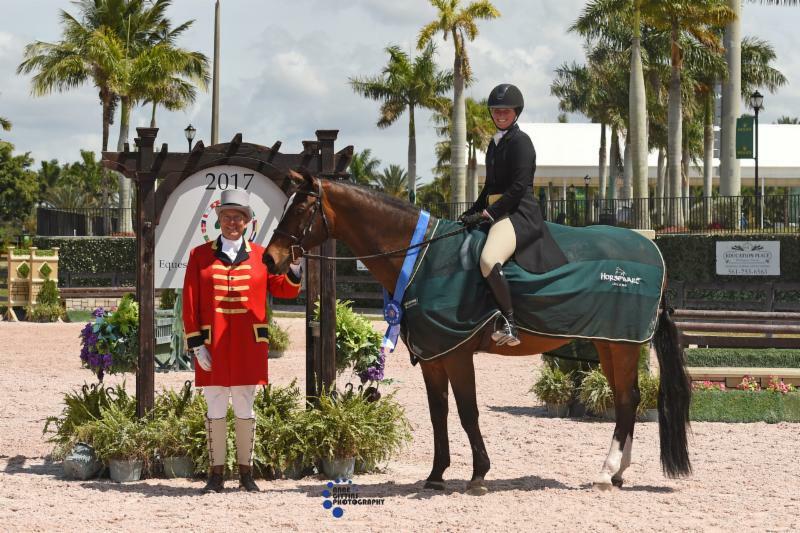 Kaitlin Porath of Charlotte, NC, guided her own Breaux to top honors in the Amateur Owner Hunter 3’3″ 18-35 Division, while Brittan Bailey of West Palm Beach, FL, and Jackman, owned by Bailey Mews, LLC, who were awarded with reserve champion. The #1 Education Place Junior Hunter 3’3″ Division was championed by Adam Edgar of Leesburg, VA, and Carasco, owned by Bill Schaub, while Zayna Rizvi of Greenwich, CT, and Verdana, owned by Laura Wasserman, were presented with reserve champion. Molly Sewell of Winter Park, FL, and Quillaja, owned by Robert Scott, collection the division championship in the Neue Schule Bits USHJA Hunter 3′ Division. Mavis Spencer of Santa Monica, CA, and Prophet, owned by Neil Jones Equestrian Inc. earned reserve in the division. Alex Elle Lignelli of New York, NY, and her own Iparty, finished atop the division in the Small Pony Hunter after several strong performances. Lauren Gee of Valdosta, GA, and Grand Slam, owned by Sweet Oak Farm, collected reserve champion. The Low Children’s Hunter Division saw Reese Madden of Southwest Ranches, FL, and Diamond In The Sky, ride to earn champion honors ahead of Isabel Beltran and her own Alleala, who finished in reserve. Michael Desiderio of Wellington, FL, and Zero Tolerance, owned by Dru Cederberg, finished as champions in the Neue Schule Bits ESP Open Hunter 3’3″ Division. Mavis Spencer of Santa Monica, CA, and Sidarta, owned by Two Swans Farm, finished with the reserve champion title. The ESP management team would like to thank all of the competitors who participated in the ESP Spring III competition and their understanding and patience with the cancellation due to inclement weather on Sunday, April 23. The ESP Spring Series will continue with competition ESP Spring IV on May 5 at Equestrian Village located at 13500 South Shore Blvd. The ESP Summer Series Prize List is now available for viewing online and can be accessed by clicking here! For more information on PBIEC and to see a full list of results, please visit www.pbiec.com. Tags: equestrian Horse Show hunter jumper Il Rubacouri Roberto Teran Jr.